I’ve resumed running around my neighbourhood this week, and have noted changes in the month I was away. When we left to go on our honeymoon, one of the things I was really looking forward to was driving on flat roads with no road cones. Road cones are a constant reminder to me of what has happened since February last year. I suspect that there are more road cones in Dallington today than there are people. It’s great that work is being done on our underground pipes, don’t get me wrong. I love having a flush toilet and clean drinking water. But every day when I leave the house, I have to think carefully about how I’m going to get out of the suburb. Every few days the road cones are reconfigured and new streets are blocked off. 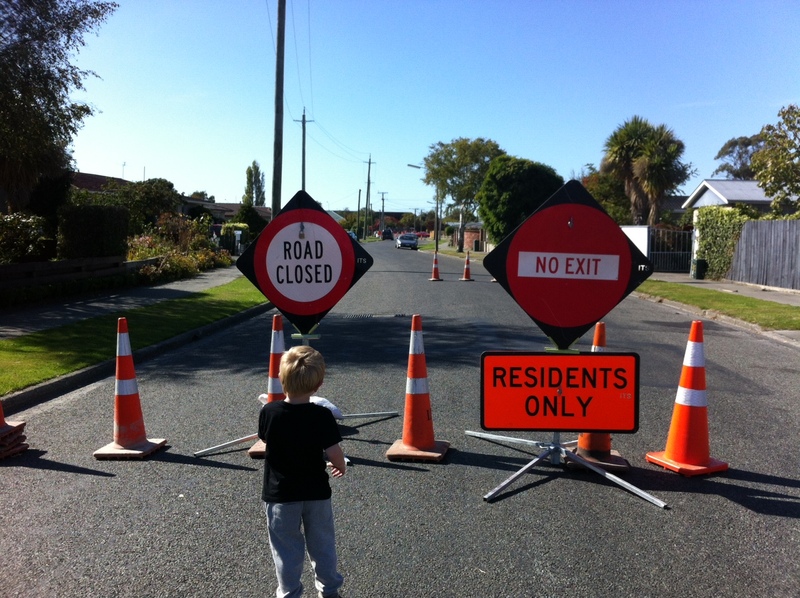 This week our street has become a ‘residents only’ zone. We zig-zag through the road cones to make our escape for the day. And then there is the red zone – the vast area of 5000 or so houses on land that has been deemed too damaged to repair. More than half of these houses are now empty. The weeds are growing up through the cracks in the pavements (waist high in some places! ), lawns are becoming jungles, the potholes are holding their ground. I estimate around 5% of the houses have already been demolished. I know one day I’ll live in a beautiful parkland with a lovely river flowing through it, native birds and plants as far as the eye can see. But for now, the place is a wreck and it makes me sad. I want it to be over, and it hasn’t even really begun yet. Know the feeling. It is a bit like a maze every day isn’t it. The way you went yesterday is blocked so where to today? Avondale Road Red Zone houses all have had their lawns cut inside and out over the past few days and looks much less depressing for sure. Hopefully they will do it for Dallington as well.Don’t know whether it was Council or our Local Neighbourhood committee.